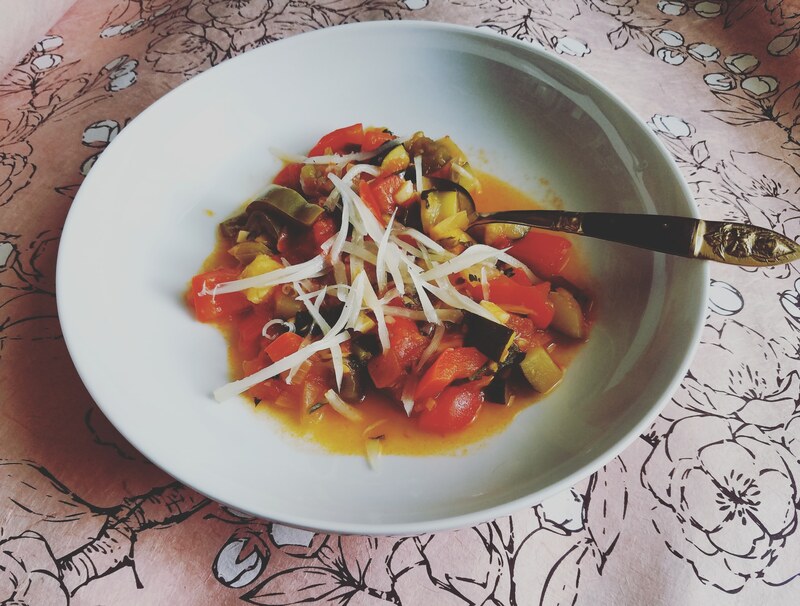 When you try this version of Pisto Manchego, you will wonder why this stew was not a regular go to soup for you. What makes this Spanish dish so amazingly tasty is that it really is a labor of love to complete. This vegetarian stew takes more than two hours to make. And guess what? It is every bit worth the wait. When I made this stew, I had just run out of olive oil and was waiting for Amazon Fresh to deliver more to me. I decided to use what I had, so I reached for ghee (clarified butter) as a substitute. That ended up being the smartest decision I could make as a substitution. The ghee was the difference to propel this dish to foodie standards. If you don’t want to use ghee, use extra virgin olive oil. It won’t taste as good as it would with ghee, but EVOO is a perfect substitute. Ghee is clarified butter, best known as an ingredient in many Indian dishes. This butter is used in many Whole 30 and Keto compliant recipes. Because ghee is gaining popularity thanks to new diets and lifestyles, it is becoming much easier to find it on the shelves at local grocery stores. I recommend finding a local Indian grocer and walking around their aisles to find ghee. My local Indian grocer has the best produce (better than regular supermarkets), and so many wonderful products. I would not have seen ghee on the shelves if my brother hadn’t pointed it out to me. I grabbed a tub and I’m very thankful that I did. In French dishes, you’ll find that they call for a lot of butter. Butter just makes everything taste better. But try ghee…you may find this butter is on a whole other level. This recipe calls for roasted garlic. If you don’t have any on hand, don’t worry. It is super easy to make. All you need is a head of garlic and olive oil. I recommend roasting your own garlic, because it will add to the overall flavor of this dish. Cut off the top of the garlic head and take as much of the outer skin off as you can, leaving at least a layer of skin on the garlic. Wrap aluminum foil around the garlic, leaving the top portion open (but enough foil to cover the top). Drizzle a couple of teaspoons of olive oil over the top, covering all of the cut, exposed garlic cloves. Cover the top of the bulb with aluminum foil. Place covered clove on a baking sheet and place in the oven for 40 minutes, or until cloves feel soft. A hearty Spanish vegetarian stew. Prepare roasted garlic (per instructions in blog post). While garlic is roasting, prep ingredients. After the roasted garlic is done, heat 2 tablespoons of ghee in a large pot over moderate heat. Add onions, fresh garlic and roasted garlic. Cook until the onions are translucent (8 minutes). Add bell peppers and zucchini. Cook for 3 minutes. Stir often. Add white wine and simmer, stirring occasionally, until wine is reduced to 2 tablespoons (5 minutes). Reduce heat to low. Add tomatoes, simmer for 30 minutes, until majority of the juices have evaporated (leave a little bit of juice, or if you prefer a more 'stewlike' soup, cook until all of the juices have evaporated). Add salt (season to your liking). Stir in vinegar, parsley and remaining ghee during last two minutes of cooking. Transfer pisto to bowls and add shredded manchego cheese on top. Enjoy!